Whilst Homi Bhabha and Vikram Sarabhai are rightly honoured as visionary architects of the Indian Space Programme, building and operationalising it fell to others. Key among these was Professor UR Rao who lead the team to build India’s first satellite, Aryabhata. He did it in just over two years with a small young team of engineers with zero experience. A major landmark in ISRO’s history, Aryabhata was launched in 1975 by the Soviet Union. Just five years later he was behind the next major milestone. On the back of a successful bid for a free launch on the then experimental European launcher Ariane, he drove the project to build India’s first 3-axis stabilised communication satellite, APPLE. That was India’s first communication satellite to operate from Geostationary orbit. He lead ISRO as the Chairman between 1984 and 1994 but never really retired. I had the good fortune of meeting him in 2013, 2014 and 2015 in his office in ISRO HQ Bangalore where he continued to contribute to numerous projects. He had started out as a cosmic ray scientist, encouraged in part by his meeting in the early 50s with the Nobel laureate Abdus Salam. He shared stories of working with Homi Bhabha, Robert Millikan, James van Allen, and Vikram Sarabhai under whom he had completed his PhD. 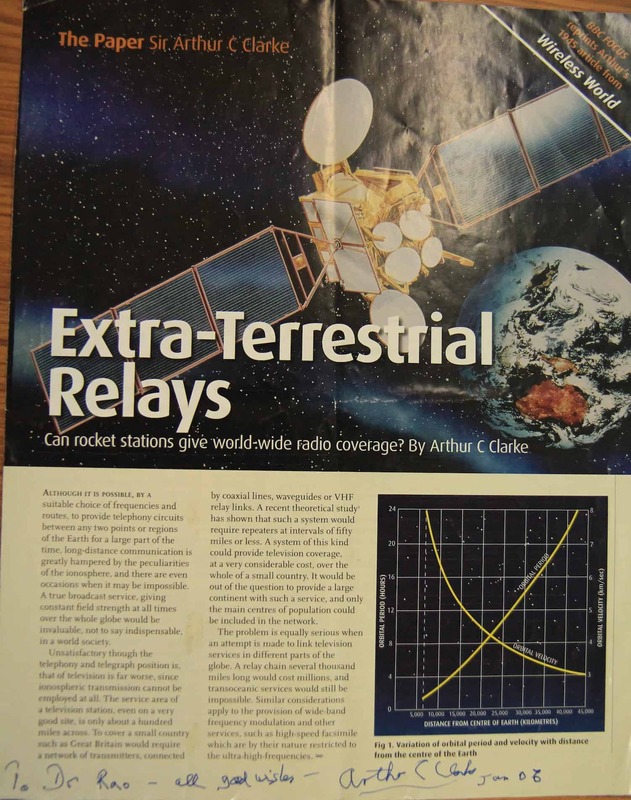 On his desk, Rao he had a signed copy of Arthur C Clarke’s seminal Paper on “Extraterrestrial Relays” that is widely seen to have introduced the concept of communication satellites. In 1975 India was experimenting with communication satellites to deliver education to rural villages in India (the Satellite Instructional Television Experiment). He told me how India offered, probably the first private satellite TV set to (the then Sri Lanka based) Clarke but India was forced to offer one to the president of Sri Lanka too. After completing his PhD in India Rao first worked at MIT and then in Dallas, Texas building cosmic ray instruments for NASA’s Pioneer, Mariner and Explorer spacecraft. Rao with his colleagues was waiting to meet President Kennedy in Dallas University when he was assassinated on 22nd November 1963. In 1993, in an hour-long meeting with US vice president Al Gore, Rao challenged US sanctions and secured concessions without which the IRS-1C mission would not have been able to proceed as planned. 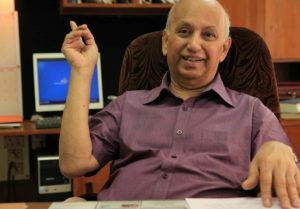 During his time has ISRO chairman, he was instrumental directing and operationalising the now highly successful PSLV. In the late 1980s, he initiated the next launch vehicle programme, the GSLV. Rao had developed a particularly close relationship with senior scientists, engineers and academicians in the Soviet Union. It was this relationship that allowed him to negotiate the Cryogenic engine technology transfer deal with the USSR in 1990. The USSR did not last, neither did that deal but Rao had set ISRO on the road to developing the GSLV and the cryogenic engine technology. During my interactions with him, I found him to be generous with his time, modest and self-effacing. He always gave credit to his teams rather than taking it as the leader. Not only had he collected a series of awards and achievements during his lifetime but he stands out as one individual who was sincerely liked and respected not just in India but the USSR/Russia and USA. Through his work with ISRO, he was fulfilling the vision of his mentor, Vikram Sarabhai to bring the benefits of space technology to the ordinary people of India. But as the considerable body of his published work demonstrates, his ambition was more global. He sought out international collaboration at every opportunity including during his numerous interactions at the UN. In the opening to the preface of his 1996 book, Space Technology for Sustainable Development, he says “The most significant human enterprise of our century is, undoubtedly, the development and application of a space technology, which has not only revolutionised the present but holds the best promise to shape our common future”. It is not an exaggeration to say that Rao believed in space technology as an essential endeavour for the future of the planet and human civilisation.